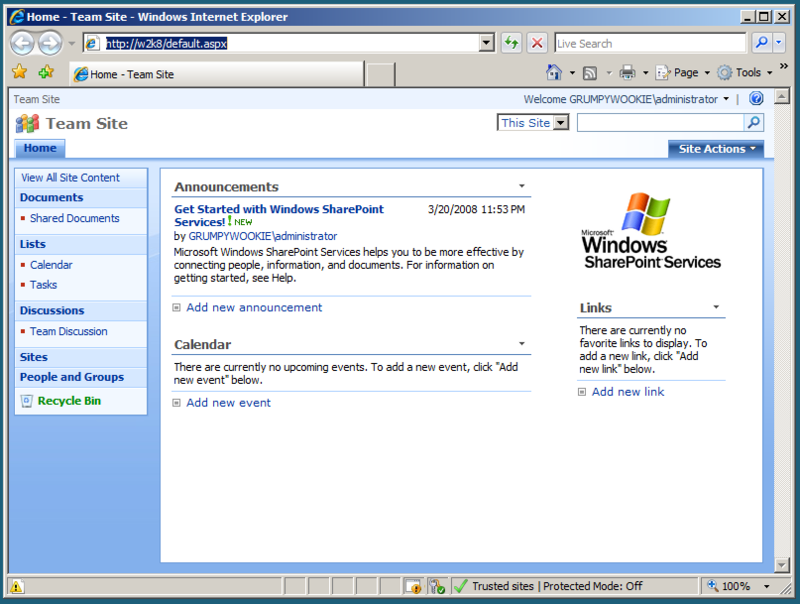 With the new Windows Server 2008 family of products released, I thought I’d try out SharePoint 2007, using Windows Server 2008 as the base O/S (within a VM). Firstly – install Win 2K8 (derr !) 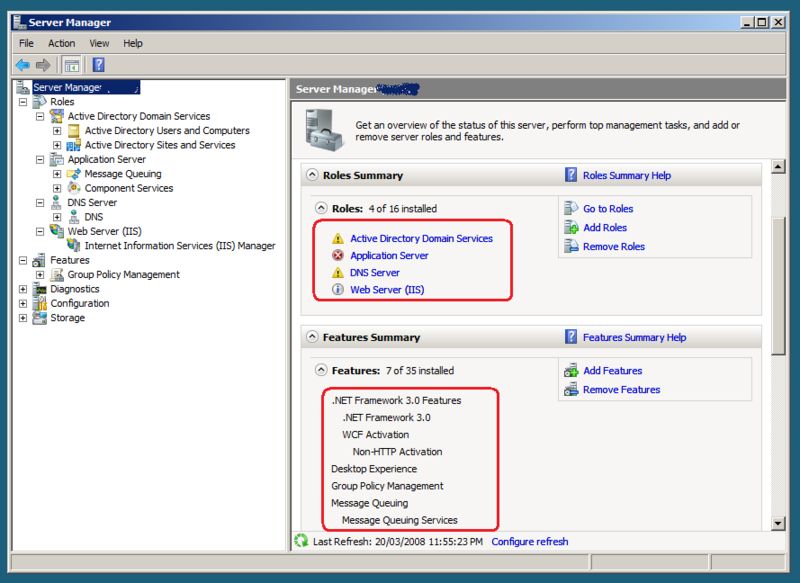 – and turn on “roles” for Web Server (IIS) and application server. Had to also turn on “features” including .NET 3.0. Next, installed SQL Server 2005 (and the SP2). All good so far ! This program is blocked due to compatibility issues. When clicking “Check for solutions online”, there was some mention of not working with Windows Vista (for some reason !). Further research & hunting determined that it may be due to Windows SharePoint Services 3.0 *NOT* being installed by default, as part of the base O/S (as was with Windows Server 2003). So – I thought I’d try out installing WSS at first – and then doing SharePoint Server (MOSS) afterwards. Installation was successful – and then ran the configuration wizard. And – have been able to use a WSS site – all OK. BUT – still had the same issue as before when trying to install “MOSS” ie. compatability issue. 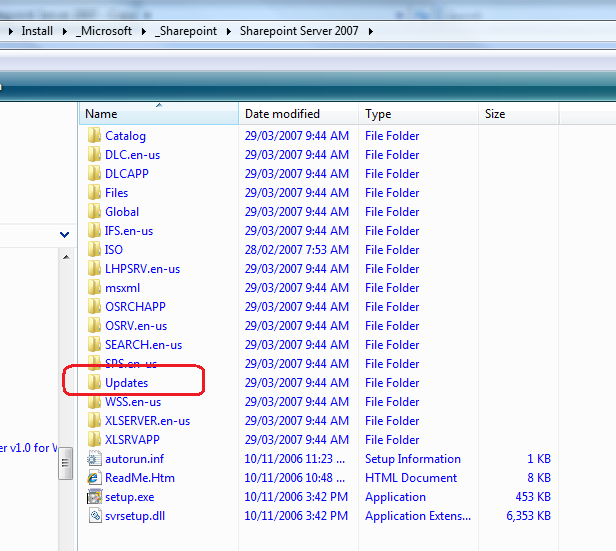 More searching/reading – and found information about needing to “slipstream SP1” for SharePoint 2007. As of the release of Microsoft Office SharePoint Server 2007 Service Pack 1 (SP1), you can install Office SharePoint Server 2007 on a server running Windows Server 2008. 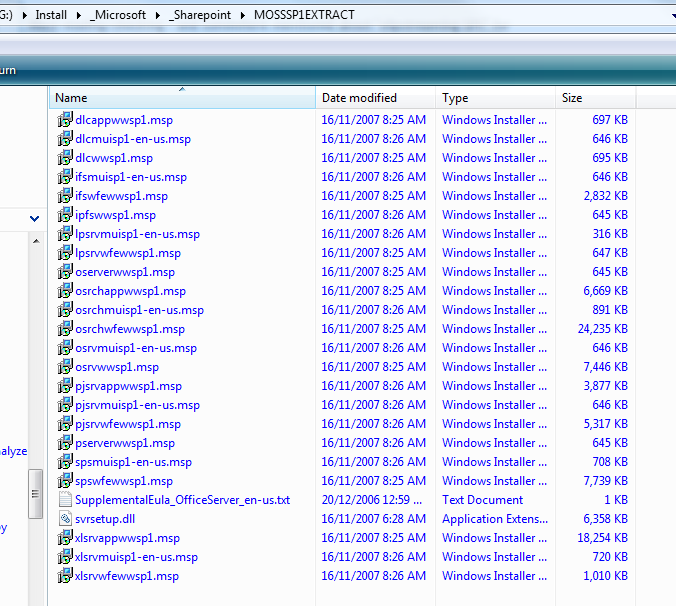 You cannot install Office SharePoint Server 2007 without service packs on Windows Server 2008. NB. You will have to accept the “license agreement” – just check the box. Finally – just copy the entire contents of the “EXTRACTFOLDER” into the “updates” folder was shown above. And, the slipstream’ing is done, dude ! And – amazingly – that’s all that’s needed, and the installation will proceed for Windows Server 2008 ! Have just noticed this post from CodeJedi, who mentions that there are now “with SP1” versions of MOSS and WSS that can be downloaded (x32 and x64). This is great news for those that are wanting to install MOSS or WSS on the new Windows Server 2008 which requires an SP1 install. But – it looks like these are only for “trial” versions – and if you don’t want to download ~300 MB, then you can use the above approach – using your existing media / installers.